This is what we've been waiting for? Update 7:40 p.m.: Samsung provided a few more details about the display in a session following the keynote. After more than an hour of tiring Bixby announcements, cursory Galaxy Home details, and long-winded IOT speeches during the opening keynote to its developers conference, Samsung finally showed us what we were all waiting for: its new folding phone. Except it wasn’t really a phone at all. Samsung’s big innovation is the Infinity Flex display, and we still don’t know much about what Samsung is going to do with it. 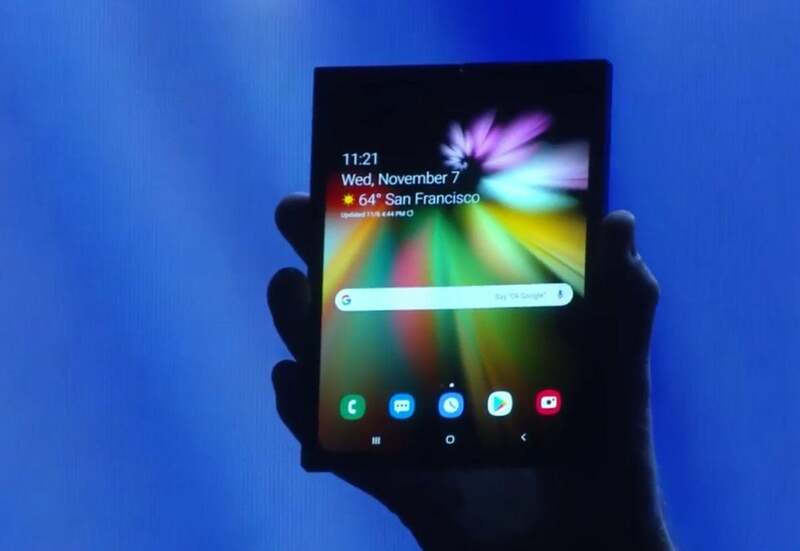 Senior vice president Justin Denison waxed poetic about an advanced composite polymer and reduced thickness that paves the way for rollable displays, foldable phones, and thinner handsets. Except he didn’t actually show us any of that. 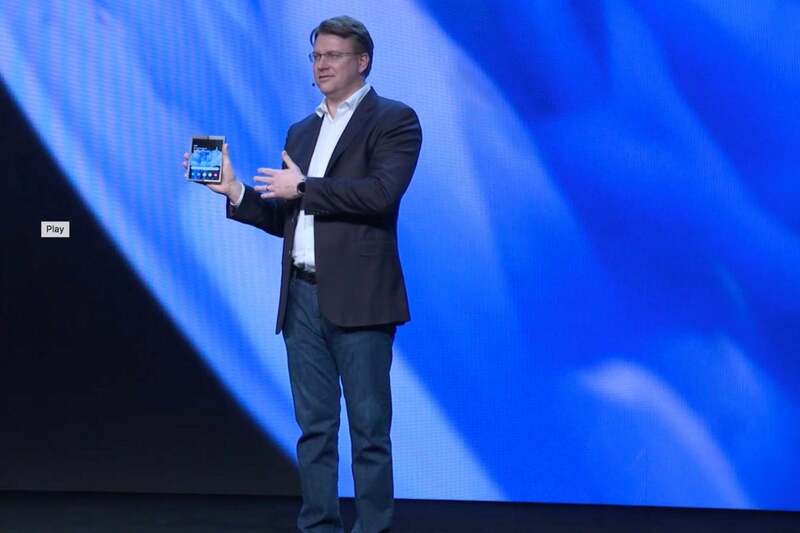 If youu blinked while Senior Vice President Justin Denison showed off Samsung’s new folding phone you would’ve missed it. The brief glimpse we got of the phone revealed a super thick handset with giant bezels and an obvious hinge. Presumably we were looking at a dummy case that concealed the real product. At least I hope we were. Because if not, it’s going to be the phone that launched a thousand memes. We don’t even really know how or if it works. The 10-second glimpse we got of it didn’t show off any functionality, and Denison made sure to keep the UI and design under wraps. Samsung even dimmed the lights on the stage so people couldn’t get a real clear look at it. So what do we know? Not a whole lot. Samsung boasted that the Infinity Flex display represents “a new mobile platform,” but the only thing we know for sure is that you can run three apps on it thanks to a new feature called multi-active window. Based on the demo, the three windows are interchangeable, with one large box flanked by two stackable smaller boxes. You can run three apps when the folding screen is opened. We also officially know that Google is on board. In a rare appearance by the Android maker at a Samsung event, Google announced that it will be officially supporting foldable displays, allowing Android apps to run seamlessly as the device folds and bringing “screen continuity.” That’s developer speak for the API that lets apps dynamically adjust to the various Android display sizes, but it’s usually not seen in action on the fly. So it will definitely require a new set of tools. But we don’t really know how that works either. Presumably, if you’re working in an app with the phone open, it will remember your place when you close it and vice versa. But Samsung didn’t demonstrate that either. 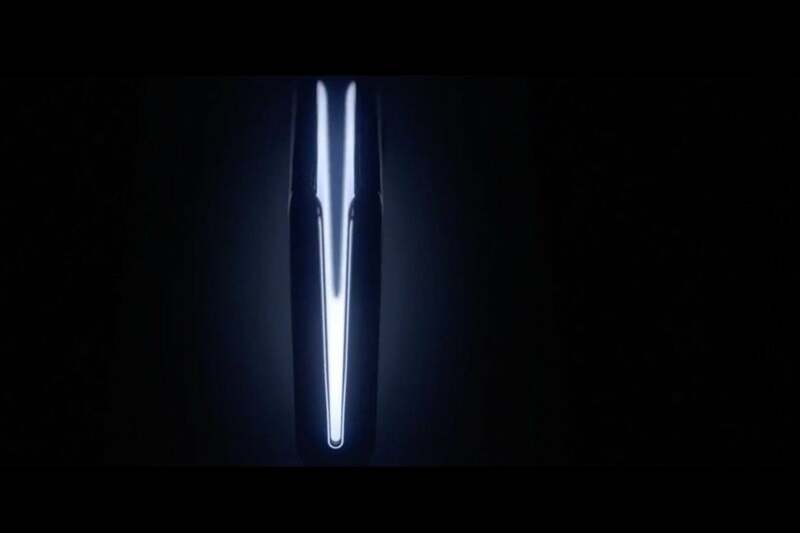 Based on the peek we got of the phone, however, it seems as though it will fold inward like a book. That means there’s a smaller display on the outside of the phone and a larger one on the inside, though Samsung says the Infinity Flex tech will allow for both inward and outward phones. As far as the UI of the new phone goes, it will be related to Samsung’s new design language, OneUI. 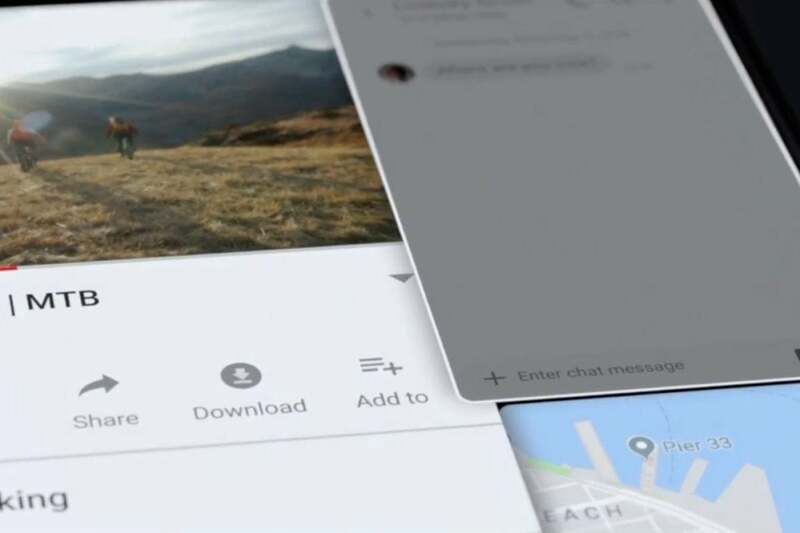 Before showing off the new phone, Samsung took a few minutes to show off its new smartphone interface, the third rebranding in as many years, following TouchWiz and the Samsung Experience. OneUI is a dramatic change for Samsung’s Galaxy phones with a cleaner interface that pushes the controls toward the bottom of the screen and creates a “content area” at the top of the screen. Samsung’s folding phone concept isn’t exactly thin. For example, in the Messages app, your conversations will start in the middle of the screen so you don’t have to reach as high to respond to a new text. And pop-ups will also be pushed to the bottom of the screen for easier access with one hand. OneUI will also include a system-wide dark mode as well as a new color scheme to match the color of the device. Samsung says it designed OneUI to keep your focus on the task at hand and minimize distractions on the screen. 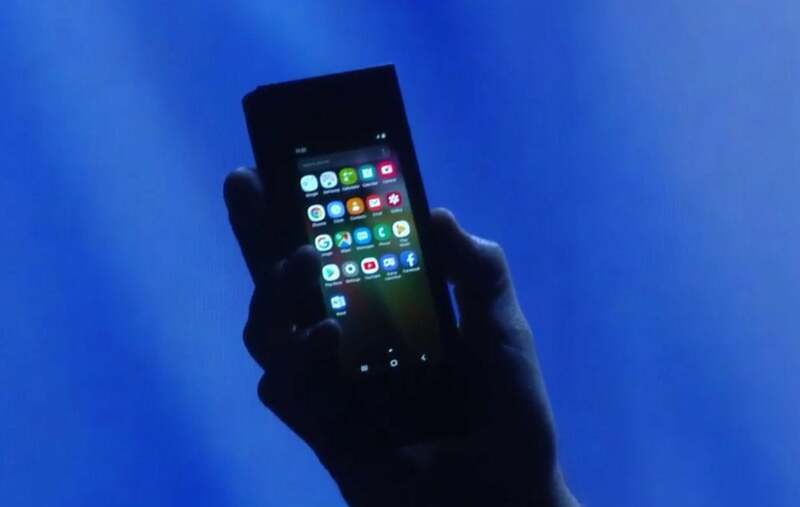 It’s not entirely clear how any of OneUI will relate to the new folding phone, but presumably the new interface was designed with the flexible display in mind. When it is coming out: Samsung said it’s ready to begin manufacturing Infinity Flex displays “in the coming months,” but it didn’t say whether they would be attached to phones. How big it is: Samsung didn’t discuss the size of either the inside display or the outside one, though it certainly looked like a small tablet when opened. If it will run regular Android apps: Samsung talked in broad strokes about the foldable UI, but we don’t really know how it will work with the millions of existing apps in the Play Store. If it will work in either orientation: Samsung showed a portrait-heavy UI, but it didn’t mention whether the phone has an accelerometer so it can be turned like a tablet. How much it costs: There was no mention of price during the discussion of the phone. What it will be called: Rumors suggested that the new phone would be called the Galaxy F, but Samsung declined to name the device it showed off. And there are a bunch of other questions too. What’s the battery life? What’s the screen resolution? How much RAM is inside it? What are the storage options? Can you answer calls when it’s opened? Is there a headphone jack? And on and on. Samsung’s new folding phone looks like a 2001 phone when closed. The only real specs about the display were revealed at a developers session after the keynote. As reported by CNET, the front display is 4.58 inches—incredibly small for a 2018 phone—with a resolution of 1960x840 and a pixel density of 420. The inside display is a great deal bigger than any smartphone on the market today, measuring 7.3 inches with a 2152x1536 resolution and the same 420ppi. The closed display would have a funky 21:9 ratio, while the inside is a more standard 4.2:3. But even with a clearer picture of the size, all Samsung really proved at its developers conference was that the thing it’s been working on for the past four years is actually a thing that’s going to come out next year. But whether that’s actually going to become a phone you’re going to want to buy remains to be seen.